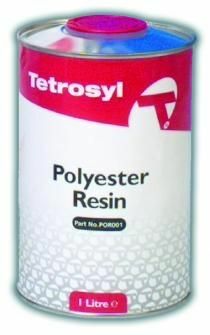 NEW CATALYST SYSTEM - Activate with Tetrosyl hardener part No. EXH001 FOR PROFESSIONAL USE ONLY A multipurpose resin with controllable setting time for mouldings, fabricating and repairs steel, alloy or aluminium (with etch primer) glass fibre reinforced plastic, wood stone etc. Can be used as a powerful adhesive. Resistant to many solvents, acids, alkalis, oils and salt water.